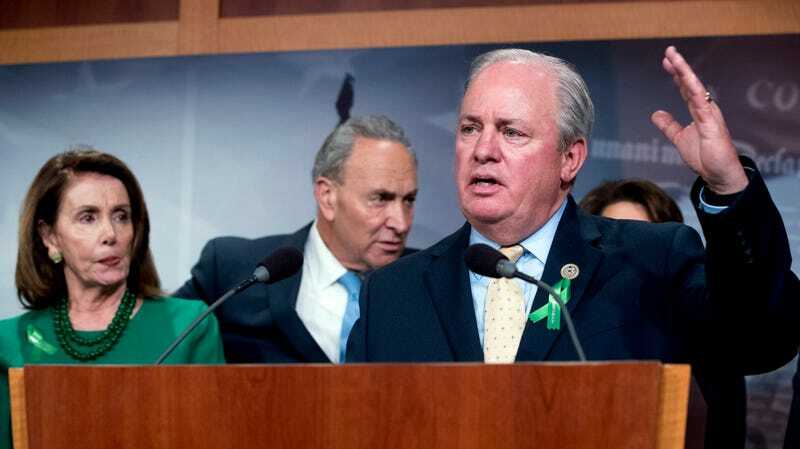 Rep. Mike Doyle, D-Pa. accompanied by Senate Minority Leader Sen. Chuck Schumer and House Speaker Nancy Pelosi on Capitol Hill in Washington, Wednesday, May 16, 2018. Democrats in the U.S. House of Representatives made good on a campaign promise on Wednesday by passing legislation that would effectively reinstate, in its entirety, the 2015 Open Internet Order—rules that, for a brief time, ensured that net neutrality was the law of the land. The bill passed in a 232-190 vote, with only one Republican voting in favor of the legislation. The bill would restore the FCC’s authority to govern internet providers under Title II of the Communications Act—the GOP’s primary objection to the bill. Democrats argue that without Title II-based rules, there would be no “cop on the beat” to ensure that the rules are enforced. Republicans such as Congressman Greg Walden, the bill’s most vocal opponent, have attempted to cast net neutrality as a “heavy-handed” approach to regulation and—hysterically—as a “government takeover of the internet.” The criticisms, however, belie the fact that broadband providers are not themselves “the internet,” and, in fact, the bill grants regulators no authority to control the content users see. Walden and other detractors have also falsely claimed, even as recently as this morning, that the bill would lay the groundwork for future taxation of broadband access, even though doing so would be illegal. Under the Internet Tax Freedom Act of 1998, federal, state, and local governments are prohibited from taxing internet access. Promises by the FCC’s chairman, Ajit Pai, that repealing the net neutrality rules would spur a new era of investment in the nation’s broadband infrastructure have also proved false. Since the repeal, network investment has fallen and major telecoms have laid off thousands of workers. In an era in which Americans seem sharply divided on nearly everything of political consequence, net neutrality is a rare unifying issue. As oft-cited by supporters of the Save the Internet Act, some 86 percent of Americans oppose the Trump administration’s decision to dismantle the Obama-era rules, including 82 percent of Republicans, according to a 2018 survey by the Program for Public Consultation at the University of Maryland. But as the ability of net neutrality to drive voters to the ballot box on Election Day remains purely hypothetical, Republicans have largely ignored its popularity among constituents, opting instead to carry water for some of the country’s most widely despised corporations. The future of the Save the Internet Act remains up in the air, as Majority Leader Mitch McConnell has promised the bill will be “dead on arrival in the Senate.” Last year, three Republican senators—Susan Collins of Maine, John Kennedy of Louisiana, and Lisa Murkowski of Alaska—broke ranks and supported a resolution to reinstate the 2015 rules. “Americans of all political stripes support putting net neutrality rules back on the books, because when you pay your monthly broadband bill, you should be able access all the content on the internet at the same speed without interference or throttling by your broadband provider,” said Senator Edward Markey, who’s introduced a companion bill in the upper chamber. The White House on Monday threatened to veto the bill. Even with the aid of the Senate’s two independents, Democrats would need to wrangle an additional 10 Republican votes to override a veto.